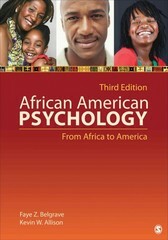 African American Psychology 3 Edition African American Psychology: From Africa to America provides students with comprehensive coverage of African American psychology as a field. Authors Faye Z. Belgrave and Kevin W. Allison expertly convey the integration of African and American influences on the psychology of African Americans. They illustrate how this group’s contemporary values, beliefs, and behaviors are derived from African culture and translated by the cultural socialization experiences of African Americans in this country. The text provides examples of evidence-based practices for improving well-being among African American communities, and addresses key methodological and research issues that are relevant to conducting research in this field. Each chapter of the text further addresses a contemporary issue of African Americans and provides a critical analysis of literature and research on select topics.